The 250 Series Double Deflection Supply Grille provides effective directional control of the air stream in one, two, three or four directions. Each bank of bars is pivoted at the front which gives a uniform appearance regardless of blade angle setting. 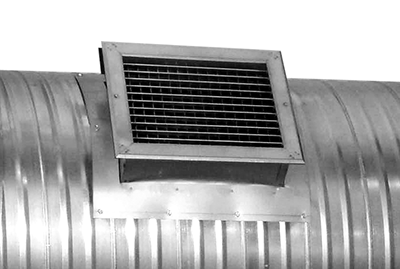 The 250 HD Series Heavy Duty Double Deflection Supply Grille provides effective directional control of the air stream. The hollow, air-foil grille front bars are set at a fixed at 0° or 45° on .500" centers. Back bars are spaced on .750" centers and each bar is individually adjusted for the desired air deflection without affecting the setting of any other bar. 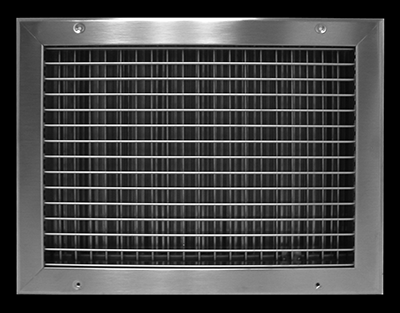 The 250LT Series Long Throw Double Deflection Supply Grille provides effective directional control of large volumes of air flow. Each bar is pivoted which allows for custom air flow. The Spiral Duct Diffuser is used in large areas — factories, warehouses, workshops and gymnasiums — where grilles can be attached directly to the spiral duct which eliminates boots or special adapters for the installation of the grilles. 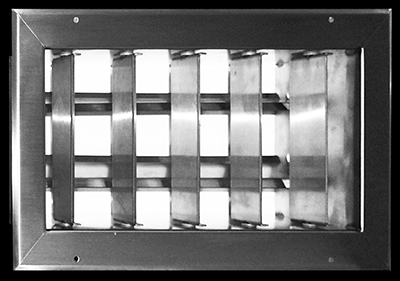 The 150 Series Single Deflection Supply Grille provides effective directional control of the air stream in one or two directions. The bars are pivoted at the face, giving a uniform, aligned appearance regardless of blade angle setting. The 150 LT Long Throw Supply Grille provides effective directional control of large volumes of air flow. Each bar is pivoted, which allows for cutsom air flow.